Analytical Methods for Social Research presents texts on empirical and formal methods for the social sciences. 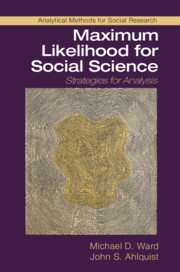 Volumes in the series address both the theoretical underpinnings of analytical techniques, as well as their application in social research. Some series volumes are broad in scope, cutting across a number of disciplines. Others focus mainly on methodological applications within specific fields such as political science, sociology, demography, and public health. The series serves a mix of students and researchers in the social sciences and statistics.